I stumbled on Bustronome by the Jardin de Tuileries in Paris last spring. A black double-decker, with subtle gold livery and a panoramic glass roof, it stood out. I asked the maitre d’ if I could poke my head inside. Downstairs, a chef was prepping lunch; upstairs, where sunshine filtered through a canopy of newly-budded trees, dappled light flooded the interior. Ah, Paris in the spring. 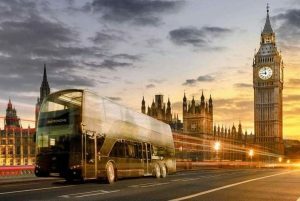 Bustronome launched in London this summer and now serves passengers afternoon tea and dinner as they are driven past some of the capital’s most famous landmarks. Starting from Embankment, the bus travels east as far as Tower Bridge and west to Kensington, hoovering up a host of iconic sites in between. So how would the custom-built restaurant on wheels fare in the big smoke? I found the double-decker (again black and gold) easily at its riverfront stop, close to Embankment tube, and headed up to the top-deck ‘dining room’. “Welcome to the first gastronomic tour of London. I’m Attila,” said one of two French waiters, as he slid a glass into the appropriately shaped slot of an apparently custom-made table holder. From another hole I took out a fat pen with pause and restart buttons. Attila opened the menu to reveal a map of our route embedded with sensors. Touch the audio pen at say, Tate Modern and you can hold it to your ear for commentary in one of nine languages. “It’s Alexa with a pointy wand!” said my friend, warming to the experience. The top deck, which accommodates 38 diners in table configurations of two to eight, has a wood-panelled floor and soft comfy seats in a neutral colour scheme. Glassware sparkled under low lighting. When we were settled, Attila brought excellent bruschetta and plump olives. We set off in the direction of Tower Bridge. The menu – six courses artfully presented – didn’t disappoint. Scallops carpaccio with pea shoots and a fennel and pomegranate vinaigrette followed a delicious soup de champignon with truffled whipped cream. Next came a delicate lemon sole “fish and chips revisited” so light, and full of flavour, I demanded Attila go downstairs and ask the chef how it was prepared. After sampling these dishes I wasn’t too surprised to find that much of the cooking happens on board, in professional ovens. With the emphasis on fresh ingredients the menu changes every six to eight weeks. Service was confident; just so – as it usually is in France and Italy – but with none of the buttoned-up haughtiness one might find in a Parisian bistro. I had boarded more for the dining experience than the monuments and landmarks I had seen countless times, but the illuminated bascules of the Tower of London, the dome of St Paul’s and the floodlit terracotta walls of the Natural History Museum loomed large through Bustronome’s wall of glass. And, on the couple of occasions I picked up the Alexa wand, I learnt things. Who knew, for example, that Piccadilly Circus gets its name from the piccadill collar, worn with Renaissance and medieval clothing? Downsides? Traffic – particularly south of the river. At London Bridge, where progress was more stop than start, I started to feel like I was on my daily commute. Usefully, the custom-made gadgets extend to the cutlery, which is held in place by magnets, effective at traffic lights. And, of course, it helps to be stationary when pouring wine. “We’re always looking for the red light,” said Attila, topping up my red, as we jerked to a halt at our billionth set of lights near London Bridge station. By now we’d eaten a tender, slow-cooked lamb fillet with mint jus and parsnip purée and a memorable Stilton served with apricots and a port reduction, and were on to the grand finale – a deconstructed apple crumble or pomme confit served with hazelnut crumbles and Granny Smith sorbet (this did particularly well on Instagram). When we finally returned to Embankment fellow diners disembarked very contentedly. “That was the best night of my life apart from the birth of my son,” said one particularly effusive passenger, shaking the hand of the maitre d’.